"Military leader of the early part of the Heian period (794-1185). The Sakanoue family had been hereditary court generals from the 7th century. Tamuromaro's father, Karitamaro (728-786), had helped to suppress the rebellions of Tachibana no Naramaro (757...) and Fujiwara no Nakamaro (764), and Tamuramaro followed him in service in the court. In 791 he was commissioned by Emperor Kammu to lead an expedition against the aboriginal Ezo people of northeastern Honshū, and he subsequently served as governor and military commander of that region. In 797 he was named 'barbarian-subduing generalissimo' (sei tai shōgun...), and in 801-802 he again campaigned in the north, establishing fortresses at Izawa... and Shiwa (both in what is now Iwate Prefecture) and effectively subjugating the Ezo. In 810 he helped to suppress and attempt to restore the retired emperor Heizei (774-824; r. 806-809) to the throne... Throughout his career, Tamuramaro was rewarded for his services with high civil as well as military posts; and in the year of his death he was appointed both great counselor (dainagon) and minister of war (hyōbukyō). 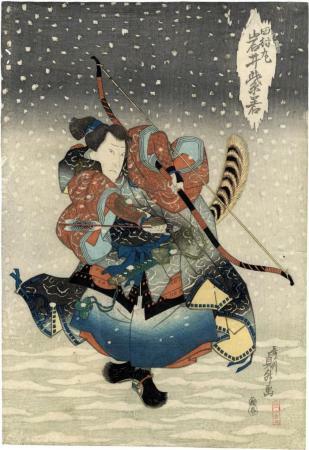 In later ages he was revered by military men as a model commander and as the first recipient of the title shōgun, the highest rank in which a warrior could aspire. Tamuramaro is traditionally said to have sponsored the construction of the temple Kiyomizudera in Kyōto." Quoted from: The Kodansha Encyclopedia of Japan, vol. 6, p. 379. The entry was written by Yagi Atsuru. There is a major nō play based around the character and ghost of Tamura. Andrew Gerstle in his Chikamatsu: Five Late Plays in a footnote says that Tamura's conquest of the Ezo territory brought a lot of new land under the control of Kyoto. "He also founded Kiyomizu Temple, claiming that it had been both the bodhisattva Kannon and the god Jishū Gongen who had ensured his success. The nō is a celebration of Kiyomizu's cherry blossoms and the power and saving grace of the deities." This was an allusion to the perfect garden in springtime. "In the second half, Tamura comes out and explains that it was the power of Buddha that won him his victories in the east in which he quelled evil demons and brought peace to the realm. The final lines praise the defeat of all enemies due to Kannon's power." This is the far right panel of a tetraptych. Sadamasu composed two of the prints and Hokuei the other two.